Office 2013 is now upon us and, much like Windows 8, there are plenty of people who are unhappy about the way things look. One aspect of the interface that has caused confusion, annoyance and derision is the decision to completely capitalize the tab labels in the ribbon. If this is something that offends your eyes, it can be addressed in a few easy steps. Microsoft’s decision to use all caps for these labels is a little odd. It is unlike any other software, including Windows 8 – even though the same style of ribbon is used throughout the operating system. Something that many people are unaware of is that Office’s ribbon labels can be renamed and this fact can be exploited to change the capitalization to something more in keeping with other applications. You might expect that making such a change would involve editing the registry, but in fact it is something that is built into the office suite. 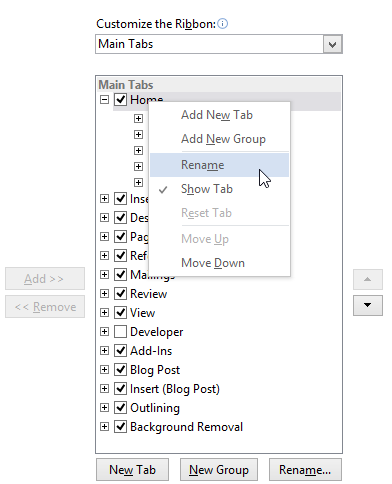 Right-click one of the tab labels and select the Customize the Ribbon option. To the right hand side of the Word Options dialog, right-click one of the ribbon labels and select the Rename option. Enter the label you would like to use and click OK followed by OK.
You will find that the labels you have renamed retain whatever capitalization you typed. Interestingly, as soon as you change the label back to its default, the capitalization changes to ALL CAPS mode once again. So what about if you want to keep the original label name, but only want the first letter capitalized? The easiest way to do this is to rename each of the labels in turn, simply adding a space to the end of the default name – for some reason this forces Office to use a more conventional form of capitalization. Unfortunately, there is nothing that can be done to adjust the capitalization of the File menu, but this simple tweak helps to improve the look of Office immensely. Have you found any tweaks for Office 2013? What do you think of the latest version of the office suite? Share your thoughts in the comments below.